A Memorandum of Understanding (MOU) has been signed between LSBU and the I-Systems College Kuching in Malaysia. 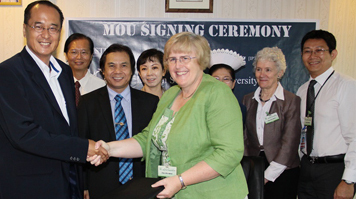 During a recent trip in March 2013 to Sarawak, Malaysia, Professor Judith Ellis MBE, Executive Dean and Professor Mary Lovegrove OBE, Faculty International Asia Lead further strengthened the Faculty's international portfolio by signing the Memorandum of Understanding (MOU) with the I-Systems College Kuching. The MOU was signed by Professor Judith Ellis of LSBU and the Chief Executive Officer for I-Systems Data John Tiong with Dr Jerip Susil, Assistant Public Health Minister there to witness the start of our collaborative partnership. The partnership between LSBU and I-Systems will work towards the production of world class nursing and healthcare professionals, this exciting new project should also hopefully see the chance for academic exchange opportunities which will be extremely valuable as career progression for staff from both institutions. This development has been big news in Sarawak with Judith and Mary's visit and the signing of the MOU being featured in their local papers The Star and The Borneo Post both on the day of the signing 13 March 2013. This was a highly successful and high profile trip which has definite potential for through the provision in Malaysia of 'in country' degree level programmes. Appearing on page 3 of a newspaper was a highlight not to be forgotten. See the news story on the MOU signing on The Borneo Post's website from 2 April 2013.